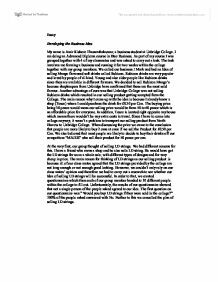 Essay Developing the Business Idea My name is Amir Kishore Thasarathakumar, a business student at Uxbridge College. I am doing an Advanced Diploma course in Btec Business. As part of my course I was grouped together with 4 of my classmates and was asked to carry out a task. The task involves me forming a business and running it for two weeks within the college together with my group members. We called our business J Mark and had an Idea of selling Mango flavoured soft drinks called Rubicon. Rubicon drinks are very popular and loved by people of all kind. Young and also elder people like Rubicon drinks since they are available in different flavours. We decided to sell Rubicon Mango's because shopkeepers from Uxbridge have confirmed that these are the most sold flavour. 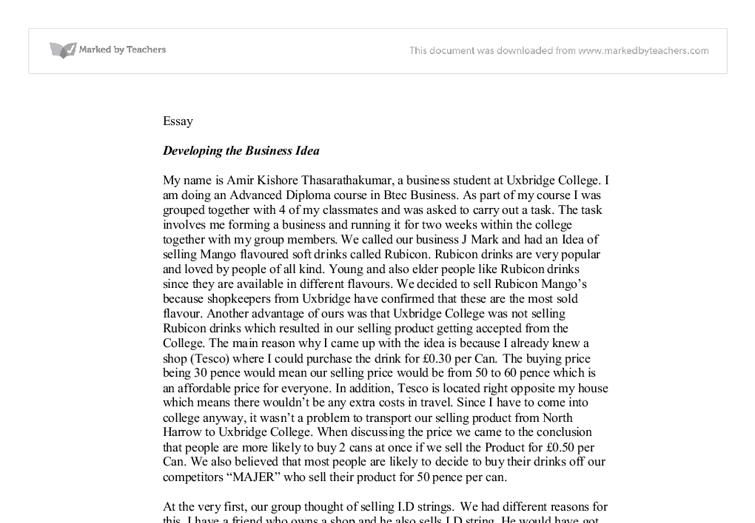 Another advantage of ours was that Uxbridge College was not selling Rubicon drinks which resulted in our selling product getting accepted from the College. The main reason why I came up with the idea is because I already knew a shop (Tesco) where I could purchase the drink for �0.30 per Can. The buying price being 30 pence would mean our selling price would be from 50 to 60 pence which is an affordable price for everyone. In addition, Tesco is located right opposite my house which means there wouldn't be any extra costs in travel. ...read more. Amir and Mehdi then went to the shop but the shopkeeper only sold each can for �0.40 which meant our profit per can will be decreased from �0.20 to �0.10 per Can. We didn't really have a choice and at that moment the offer was our last option. Although, we couldn't make as much profit as usual, but still managed to run our stall for the 2 hours. A Table of our cash flow is shown below: What activities did you undertake in order to put your business idea into practice? The first meeting within the group was held roughly 2 weeks before we started to run the business. The meeting was to choose a name for our business and to decide about who will overtake which role in the business. Everyone of our group first had a chance to talk about any previous experiences in business which included running a stall, leading a team etc. Since Joy had previous experience in leading a team and has already gained very good communication skills she was chosen to be our team leader and managing director. All of us thought our business name should be unique and therefore we decided to call our business"J MARK". The name is made up of all our group members first names' first letter. J for Joy, M for Mehdi, A for Amir, R for Rahila and K for Karm. ...read more. 30/11/2009 9am 9:55 am Purchase Product From Tescos (50 Cans) Setting Up Stall, Hanging Up Posters on Display Boards 03/12/2009 9:55 am Setting Up Stall, Hanging Up Posters on Display Boards 04/12/2009 9am 9:55 am Purchase Product From Tescos (20 Cans) Setting Up Stall, Hanging Up Posters on Display Boards I think our business was very successful. Especially when compared with the other groups (Majer, Cakes and Bakes etc.) We made the most profit in our class which makes this an achieved business objective of ours. Our idea to set up the stall nearer to the exit was an excellent idea because we was right outside the door where staff come out of and also adjacent to the barriers where everyone walks through to get outside the college. The most beneficial advantage was our selling product. We are glad that we had the idea of that product before anyone else did. Rubicon is a very famous and preferred drink. This got us many customers each day. The time at which we run our stall was inappropriate on some days. The time at which the mall is the most crowded is 12 pm since that's when everyone usually comes out for their lunch break. We were not allowed to choose the times for our business ourselves. On some days the college told us to run our stall at 10 am which meant the mall was still quiet empty. We are sure that we could have sold much more if we were allowed to run the stall from 12 pm to 3 pm. ...read more. Tesco Monaghan along with other Tesco stores has also started to make deliveries using battery-powered vans saving fuel costs and CO2 emissions. In order to meet customers' requests for Tesco's help in identifying their customers carbon footprint, Tesco have joined forces with The Carbon Trust. Posters Images, visual display Anyone who can see Gathered information, attractive, contain valuable information Fax Documents sent through telephone Staff, customers Its quick and it provides valuable information Section D The presentation of complex internal business information. In this section of the Handbook i will show three different methods the organisation uses to present internal business information. was a raining seasons so, many customers does not want their window clean. Consequently, my balance was negative again for three months. However, the sales started increasing in October, but started to decrease again, as result the payment was incredible high nearly half of the sales have to pay for the payment and its make the balance decrease. Another PEST factor that I think could affect Ginsters is Pressure groups. This factor is the effect that pressure groups can have on a business. A pressure group is an organisation of people who have the same beliefs about something. Climate change levies is a sort of tax that retailers have to pay in order to import food to the UK from other countries, because by bringing food here to the UK, planes or boats that are used for the transport of goods emit CO2 in our atmosphere and pollute the air. Tesco has reduced the prices of more than 3,000 products that customers need to buy every day - such as milk, bread, fruit and vegetables. Customers are turning away from expensive brands to more affordable own label ranges. Tesco brand products are the most popular in the country and are now even better quality.